Hitachi KTM rider Ben Watson narrowly missed out on the top step of the podium as team mate Josiah Natzki suffers from a series of crashes. 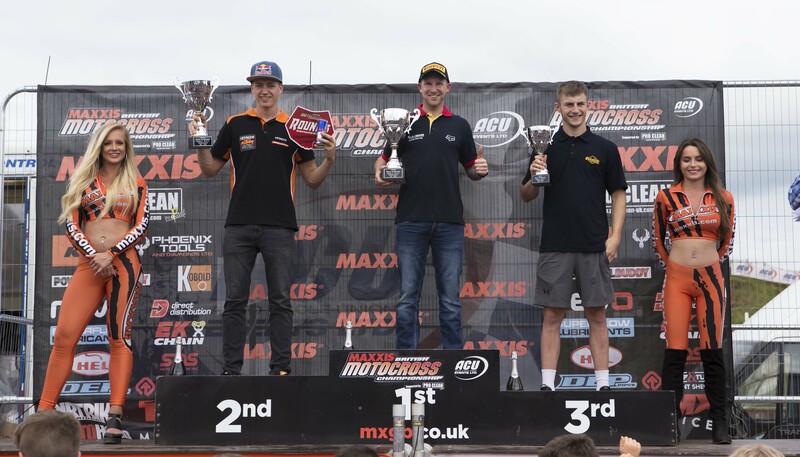 Hitachi KTM’s young star rider Ben Watson narrowly missed out of the top step of the MX2 winner’s podium at last Sundays round five of the Maxxis British Motocross championship after a bad start in race one saw him having to charge through the pack from twenty first on the first lap to third place by the end of the sixteen lap race. Although Ben won the second race the overall result went to race one winner and local rider Martin Barr by just two points. Ben struggled in qualifying which gave him tenth gate pic while his team mate Josiah Natzki crashed heavily after setting fourth fastest time, which seemed to shake him up a bit. Michael Eccles got the holeshot at the start of the first MX2 race with Barr second from Josh Spinks, Jake Sheriden and Josh Gilbert. Josiah collided with another rider half way round the opening lap and went down leaving him at the very back of the pack and with a lot of work to do. Lap after lap Ben passed the other riders till the halfway point in the race, he was up to fifth place as the lead swopped from Eccles to Barr. Ben was clearly the fastest rider on the track and as they started the last lap he was in fourth place and closing in on third place man Todd Kellett while Barr still lead from Eccles. Barr crossed the finish line to take the first MX2 championship race win from Eccles who had Ben under three seconds behind him. Ben’s team mate Josiah struggled to get going after his first lap incident but made his way up to sixteenth place before finishing in seventeenth place for just four championship points. Barr got the holeshot at the start of race two but was passed by Eccles by the end of the first lap, with Ben after a better start was fourth. On lap three Ben was in second place after passing both Barr and Kellett but by the half race distance took the lead and cruised to a comfortable win by ten seconds. As the riders started their last lap Ben was the overall champion as he would have tied on point with Barr, the overall win in a tie situation going to the highest placed rider in race two, but Barr managed to pass Eccles with half a lap to go snatching the win out of Ben’s hand. Ben’s main rival for the championship, Harri Kullas, was riding injured and could only finish twelfth overall which increases Ben’s championship lead to forty-one points over new second place man Barr. 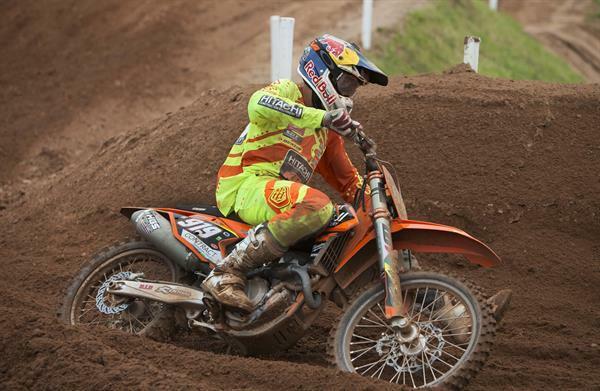 Other notable KTM finishers was a strong second place in the MX1’s for the ever popular Brad Anderson. The Hitachi KTM teams next outing will be round eleven of the world championships at Ottobiano in Italy. 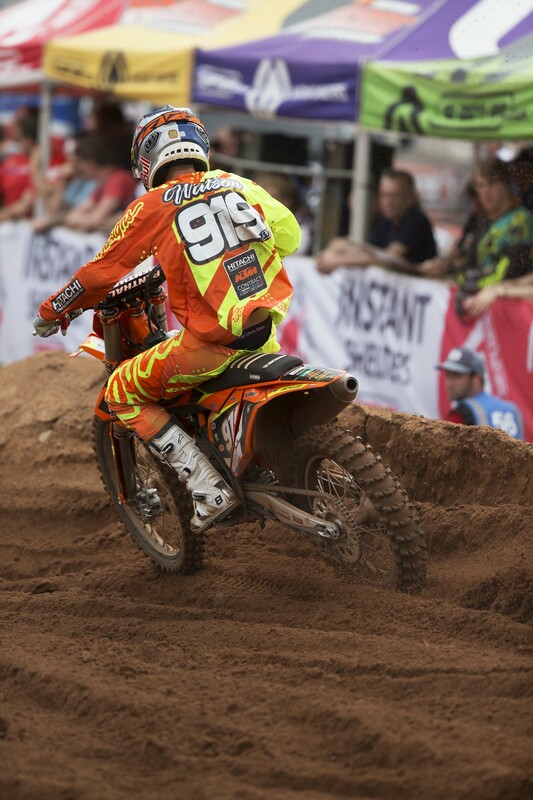 Ben Watson 919 – MX2 overall second.